First, Supergiant Games' acclaimed action RPG came out for the Xbox 360 as one of the games in Microsoft's annual Summer of Arcade promotion. Then, shortly after that, the narrator-centric release landed on Steam, which let PC owners tour the game's shattered world of Caelondia. Now the hit indie's been made to play in Google's very own browser software— at full resolution and everything—where even more people can experience one of 2011''s best games. Hopefully, that gamepad support will find its way into this web version before too long. I gave the free trial of browser Bastion a spin on my iMac this morning and it looked as beautiful as it did on the Xbox 360. There's a significant chunk of initial load time as the game boots up but it ran smoothly for the 10 minutes or so I fiddled around with it. The game saves your progress to the cloud, which makes me think you can stop and start on different machines. However, you'll need a Google account log-in to do this. If you're curious, definitely try it out. 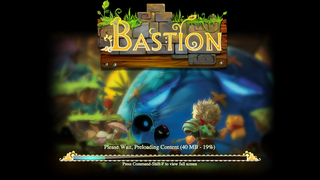 Bastion's live on the Chrome web store now and, after the free trial, the full game's available for purchase at $14.99.